Although it’s hard to believe (especially if you still haven’t gotten around to taking down your Christmas lights display), January is almost over. February is bearing down upon us at breakneck speed, which means that holidays like Ground Hog Day, Valentine’s Day, and, here in the U.S., Presidents’ Day, are just around the corner (not to mention that event sacred to Americans everywhere, myself included, the Super Bowl). These days, sadly, Presidents’ Day is probably more closely linked in the public’s mind with car sales and great deals on ski packages than it is with honoring two former presidents. Nonetheless, with Presidents’ Day looming ever closer, it is no surprise that American bloggers’ thoughts are turning to George Washington. 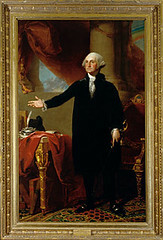 Joel Schoenmeyer reports in his Death and Taxes blog that George Washington was evidently an early proponent of alternative dispute resolution—George’s will included an ADR provision. You can read Joel’s post for the text of the relevant provision of the will, or you can read the entire document online yourself here.